Hoist and Winch has developed a large customer base, building great relationships and delivering every time to fully meet the customer’s needs. With this particular cement industry customer Hoist and Winch have completed a number of lifting system projects as well as handling the annual service contract for all of the powered lifting equipment located at their main UK manufacturing site. For this particular application our customer approached us to supply and install a new 1000 Kg Swl x 12 metre long monorail lifting beam complete with a manual chain block running in a manual trolley in order that the removal of two existing large conveyors and the installation of a new conveyor could take place in their re-designed Cement Bag Packing Plant Area. An initial site survey visit was arranged which included very precise measurements being taken to ensure that the position of the new monorail beam was correctly aligned with the location of the lifting eyes on the conveyors. One design complication was that the new monorail beam had to run at an angle of approximately 45 degrees to the existing free standing goal posts already located in the area and to which the new monorail beam was to be attached in three places i.e, each end and centre position. The attachment method chosen for the monorail beam to existing goal posts was a clamping plate arrangement using special Lindapter Clamps which would allow for a degree of adjustment during the alignment of the monorail beam which was to be manufactured in two 6 metre long sections complete with a bolted joining plate at the centre position. The hoist unit selected in this case was a Yalelift 360Ò MK III 1000kg SWL manual hoist with an integral manual geared trolley, giving the operator optimum control in terms of lifting/lowering/travel movements and a very close headroom dimension. Once finalised, the customer rapidly accepted our proposal, and general arrangement drawings were issued for joint approval prior to manufacture. Monorail Beam manufacture in accordance with BS2853 then took place over a 4 week period. The critical nature of the project resulted in very closely monitored working practices calling for very stringent planning of all work activities and therefore all on site work had to be very carefully documented with Risk Assessments and Method Statements which were reviewed and agreed by the Project Manager & Health & Safety Dept before all work commenced. Due to the proposed location of the new monorail beam, the installation work was not straight forward as we had to raise the monorail beam sections 14 metres up into the top floor work area where they were to be installed and this needed to be carried out without the use of a mobile crane due to various site restrictions. 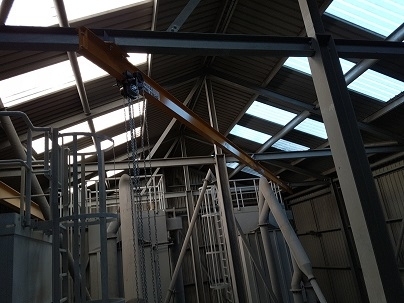 In this case we utilised an existing lifting beam which cantilevered out above the yard area below whilst slinging of the beam sections was critical for this quite difficult lift due to the way the beams had to be raised and then turned through barn type doors and into the building with minimal room either side. Once the monorail beam sections were landed in the top floor work area of the building, Hoist and Winch now had the task of lifting the beams up to and over our installation scaffold hand railing to the point of installation with the use of manual chain blocks and lever hoists being the only option. To facilitate these secondary lifting operations we also utilised various existing support steelwork positions already located in this area. Once in place, the monorail beam sections were finally installed/secured in the required position and correctly aligned to the customers requirements. The Installation work involved the use of various pieces of lifting equipment including manual chain hoists, lever hoists, slings and shackles. Lever hoists are a very useful lifting aid as they can be used for lifting, dragging and lashing applications and are particularly helpful when aligning components during assembly work in restricted areas such as this monorail beam installation in dismantled form. After all the very careful planning we were able to carry out the installation with no complications and once completed we load tested the monorail beam in accordance with LOLER 1998 regulations and the monorail beam was certified accordingly with a LOLER Thorough Examination Report. Contact Hoist and Winch Limited for your special lifting application projects.